CimWave is a Cimcoin-powered Internet-shop of highly discounted innovative products and shares of high-growth startups. CimWave helps innovators create new market niches for breakthrough products faster and at low cost. Enthusiasts who want to acquire a breakthrough product before anybody else often don't have enough money to buy everything they want. 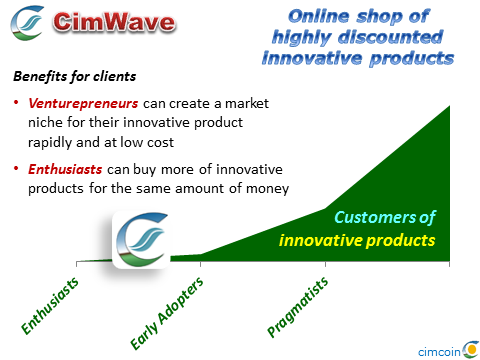 CimWave also allows enthusiasts to buy more of innovative product for the same amount of money. Selected high-potential startups will be able to sell a limited number of their shares though CimWave at 50% discount. Benefits for startups: powerful promotion of their business; demonstration of their attractiveness to individual investors through crowdfunding. Unlike other online wallets, we'll pay 2% extra interest rate (against U.S. $ interest rates) to those who prefer to keep some money in Cimcoins. We'll limit the turnover of CimWave to US$ 1 million until we have the business model fine-tuned.